Spicy Crispy Chicken Bites! I love these as an appetizer dipped in mustard or on top of a salad for added crunch. They are super simple to make and stay fresh/crispy even after a few days! I have a recipe on my blog for curry turmeric chicken fingers, but I think these are a bit more fun and less messy to make. They are completely dairy free and gluten free! I used a mixture of panko crumbs as well as my favorite grain free tortilla chips. (I used Siete Food Fuego flavor). The flavor of those tortilla chips have tons of flavor but feel free to use all panko crumbs or any of your favorite chips! For this recipe I used three thin chicken breasts (no skin), 2 eggs, and a mixture of 1 cup panko crumbs and 1 cup of the grain free tortilla chips, crushed. I cut the chicken breasts into bite sized pieces, dipped them into the egg wash mixture, and then carefully into the breadcrumb mixture. Adding them to the baking sheet, I baked them in the oven for about 20 minutes and they were perfectly cooked in the center and crispy on the outside! To make them extra crispy, either spray them with a little coconut/avocado oil (or any you prefer) OR place them under the broiler for the last 2 minutes. To store them, make sure they are completely cool before placing them in an airtight container in the fridge! They will last about a week and if you want to reheat them, place them on the baking sheet at 400 degrees for about 8-10 minutes or under the broiler on high (just watch them!) for about 3 or so minutes. I hope you enjoy them! You can serve them on their own with your favorite dipping sauce (hummus, mustard, ketchup) or served over a salad, as an appetizer with celery/carrots, or inside taco shells! 2. In a small bowl, add your two eggs, beat lightly. 4. Cut the chicken into bite sized pieces. 5. Dip the chicken bites into the egg wash and then carefully with your other clean hand, coat them into the dry ingredients. Place on the baking sheet. 7. Bake in the oven at 400 degrees for about 25 minutes. FLIPPING halfway through. 8. The inside should be completely white and the outside will be crispy and start to brown. 9. Serve immediately. Store up to a week in the fridge after they have completely cooled in an airtight container. To reheat add to baking sheet under broiler on high for 2-3 minutes or at 400 degrees for about 8-10 minutes! When I was younger one of my favorite things to order at an Italian restaurant was chicken parm! I loved the crispy breaded chicken with a flavorful red sauce along with the pasta as the side. To be honest, I probably loved it so much because it reminded me of chicken fingers and at that time my body was pretty much made of them. So ordering chicken parm felt like the only way I could eat something as close to chicken fingers without having to actually order them, since they usually weren’t always on the menu. The chicken is tender in the middle and has a super crispy crust full of flavor. I used a mixture of panko crumbs as well as nutritional yeast along with sea salt, pepper, and oregano for the seasonings. I love panko crumbs because I think that it always adds extra crunch to just about anything, but if you do not have any on hand you can use your favorite Italian breadcrumbs or even make your own - simply blend together your favorite crackers in your food processor until it resembles the same texture as breadcrumbs! I used nutritional yeast just for added flavor, which slightly resembles that of parmesan. If you aren’t dairy free, replace with parmesan! Once the chicken breast as been coated with the breadcrumb blend, I decided to lightly fry it in my cast iron pan for about 4 minutes on each side and then transferred the cast iron into my oven and allowed it to continue to bake for about 20 minutes or so. This will greatly depend on the size (thickness) of the chicken breasts. If they are thick, I do suggest baking them in the oven so they can cook all the way through. However, if you flatten out the chicken and they are thin, then you can simply cook the chicken in the cast iron for about 5 minutes on each side! Both ways will taste the same! I served this with brown rice and sautéed broccoli, but you can do any veggies you like or even pasta! For the brown rice, I cooked according to the directions but I love adding in either 1-2 tbsp. coconut oil or about 1/4 cup of canned coconut milk. It tastes amazing that way and so creamy! You have to try. The entire dish stays well for left overs the next day and I actually do not mind eating the chicken cold! Dipped in any type of sauce (honey mustard!) it tastes so good! 2. Cook the rice according to directions. When the rice has about 5-8 minutes left add either the coconut oil or the canned coconut milk, if using. While the rice is cooking; prepare the chicken. 5. In a small bowl mix together the panko crumbs, nutritional yeast, and seasonings. 6. In a separate bowl, add the melted butter. 7. Frist, dip the chicken breasts in the butter so it is evenly coated. 8. Second, dip the chicken into the breadcrumb mixture so it is evenly coated. 9. In a cast iron pan, add 2 tbsp. olive oil, over medium heat. Add the chicken when the pan is hot and allow to cook for 4 minutes on each side. 10. Transfer the cast iron dish into the oven and bake at 400 degrees for about 20 minutes. Allow to cool for 3-4 minutes, then slice. Cook the broccoli in a skillet over medium heat with olive oil until slightly tender, with sea salt and pepper! About 8 minutes. Store any leftovers in the first for up to 3-4 days. a homemade clam chowder that is not only SUPER creamy but dairy free! Here’s a secret; I have never actually had clam chowder or made it, until the other weekend. The most obvious reason is that I am allergic to dairy and almost every single place that I’ve been to always makes them with cream, milk, butter and so on. For a few weeks my boyfriend had asked me to try and make one that is dairy free - he loves it and lucky for him he doesn’t have an food allergies. To be honest, I kept putting it off because I wasn’t sure if the ingredients I would need to use, would result in that creamy comforting factor that you get from a “regular” clam chowder. I hate buying a bunch of ingredients and spending the time and the money making a dish when it just doesn’t come out the way you had hoped for. Last weekend I decided to finally give it a try because I love clams and to be honest, the recipe is way easier than it seemed. You’re going to love it; minimal ingredients, confronting, much healthier, and it comes together pretty quickly. Ok, so to give a dairy free clam chowder a creamy thick texture, I decided to make my own homemade cashew milk. (Don’t be turned off yet!). There are a few reasons that I decided to use cashew milk - one you do not have to strain it at all as you would with almond milk, soaked cashews blended are this little miracle nut- they can be turned into a cream, cream cheese, frostings, used for desserts, making a raw cheesecake; really just about anything you can think of - you can use the cashews for. Lastly, I have made my own homemade cashew milk so many times that I knew when it would be heated over the stove top it would thicken quickly versus any store bought brand. For the cashews, since you do need to soak the cashews in water first, I prepared that the morning of! I simply let the cashews soak in water on the kitchen table for about 4 hours. After you drain and wash them completely, you will need to blend the cashews in the blender with clear water. THAT IS IT. You can also soak the cashews overnight or in the morning before you head to work and they will be ready when you want to make the chowder. Here is my recipe for homemade cashew milk. Any leftover cashew milk you have from the recipe you can store in the fridge for up to 4 days and use for your smoothies, oatmeal, chia puddings, etc. The other things that I added to the chowder, were turkey bacon (optional), chopped celery, onion, and the clams! When I added all the ingredients into the pot and let it simmer for about 20 minutes, it thicken and tasted amazzzzzzing. You have to make it; it is worth it. See the notes section for any additional things you might want to check out before making! For this recipe you will have leftovers unless you are serving up to 4 people, but you can freeze whatever you do not eat and then re-heat for a quick soup after work on a cold day. 1 cup cashews, soaked in water for 4+ hours. * For the clam juice & canned clams, I purchased these at Whole Foods. Check the store locator OR use any brand you prefer. To make the cashew milk. Yields about 2 cups. Soak the 1 cup of cashews in water, covered. Overnight or for 4 hours. Drain, rinse and add the cashews to your blender with 2 cups of CLEAN water. Set aside and prepare the rest. Roast the sweet potatoes in the oven for 35 minute at 425 degrees. Lightly coat with coconut oil or olive oil and sea salt. Prepare the rest below. In a large pot, add about 2 tbsp. olive oil. Add in the celery. While the celery and the onions continue to break down. Cook the turkey bacon in a skillet if you are using according to directions on packet. Remove from pan when done and place on a paper towel to let it absorb any extra oil. Add the turkey bacon, chopped to the pan with the clam juice and 2 cups of the homemade cashew milk. When the sweet potatoes are done, add to the pot. Allow this to simmer for 20 minutes, covered, on medium to low heat. Stirring occasionally. Add the canned clams, sea salt, pepper. Taste test and adjust to needs. Allow this to heat for about 5-10 minutes. Serve immediately. top with extra turkey bacon and crackers! I did not test out any other nut milks nor full fat canned coconut milk. Any store bought milks will change the texture. Full fat canned coconut milk might be too rich / heavy tasting. Store in an airtight container in your fridge for up to 2 days or freeze for longer! To re-heat add to a large pot, to medium heat and allow it to simmer until warm. Adjust seasonings and spices used to your preference. To save time, I prepared the sweet potatoes the night before while I was roasting other vegetables. The brand of the clam juice and the canned clams I used, I purchased at Whole Foods. Sub any brand of preference. The easiest pumpkin chili that is so flavorful, comforting, and really satisfying- all can be made in less than 30 minutes! I had zero intention of making this pumpkin turkey chili over the weekend; especially on a Sunday. My Sunday’s are pretty low key, spent all day watching football and cooking food for “fun.” I normally make a lot of food on Sunday just to pick at, nothing is really a meal, but just a bunch of snacks to graze on all day long during the games. It is like a free for all type of day, anything goes and I make things that might require a bit more time than something I would make over during the work week. I find that sometimes when I make recipes for the blog, I often stress out over the ingredients, put pressure on myself for the photos, and even though I LOVE it, it sometimes takes the joy out of simply just cooking to cook. 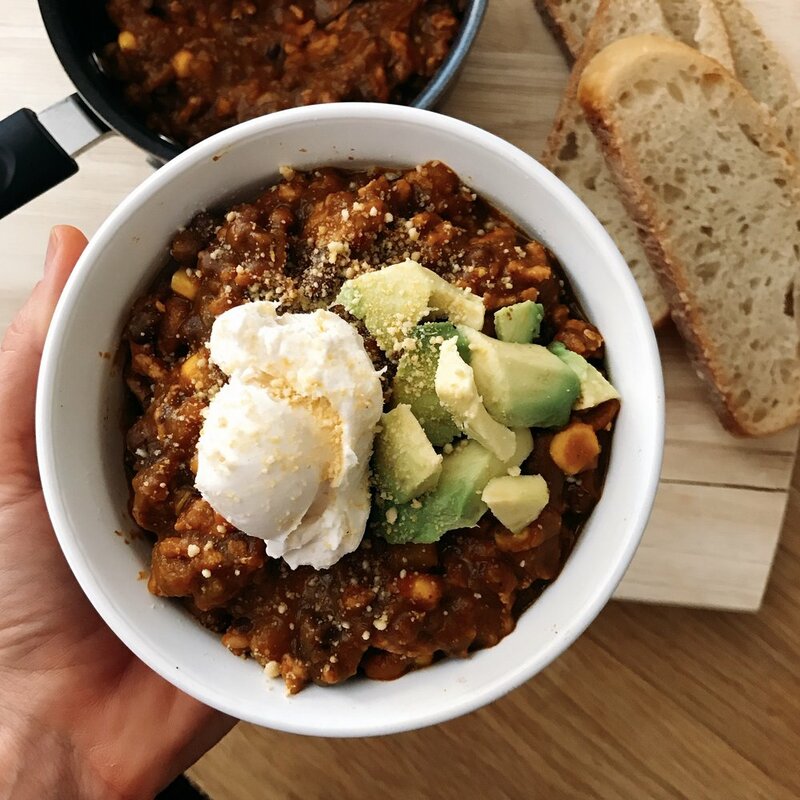 Since I wasn’t planning on cooking the chili today, I didn’t have all of the ingredients that I wanted to use, but I decided that I could make due with what I had in the fridge/ cabinets and hope that it turned out tasting really good….and it did! This pumpkin turkey chili is SO EASY and it can be ready in less than 20 minutes. I do love letting it simmer all day so all the flavors can marinate together, but that isn’t necessary. Adding the canned pumpkin puree into the pot along with the ground turkey, beans, and a few other ingredients; gave the chili a creamy texture. Plus; not only is it good for you (vitamins, fiber) it adds in that comforting factor that we start to crave come Fall. I love the chili with tortilla chips, a scoop of dairy free cream cheese or sour cream, or crusty sourdough bread. It will last all week in the fridge or you can freeze it and have something handy during the winter colder months. For this recipe, you can sub ground turkey for beef if you prefer OR make it completely vegan friendly by adding more black beans/kidney beans, quinoa, or lentils. I have ZERO experience cooking with tofu or any other meat substitutes so I can’t offer any suggestions. For the veggie part, I added in corn and butternut squash, but red bell peppers, carrots or any other vegetable are perfect too. Once the ground turkey started to brown in a separate pan, I added all of the ingredients including the cooked turkey into a large pot and let it simmer all day. If, you are in a pinch, all you really need to do is add everything in and heat it up until it is warm (10 minutes or so). 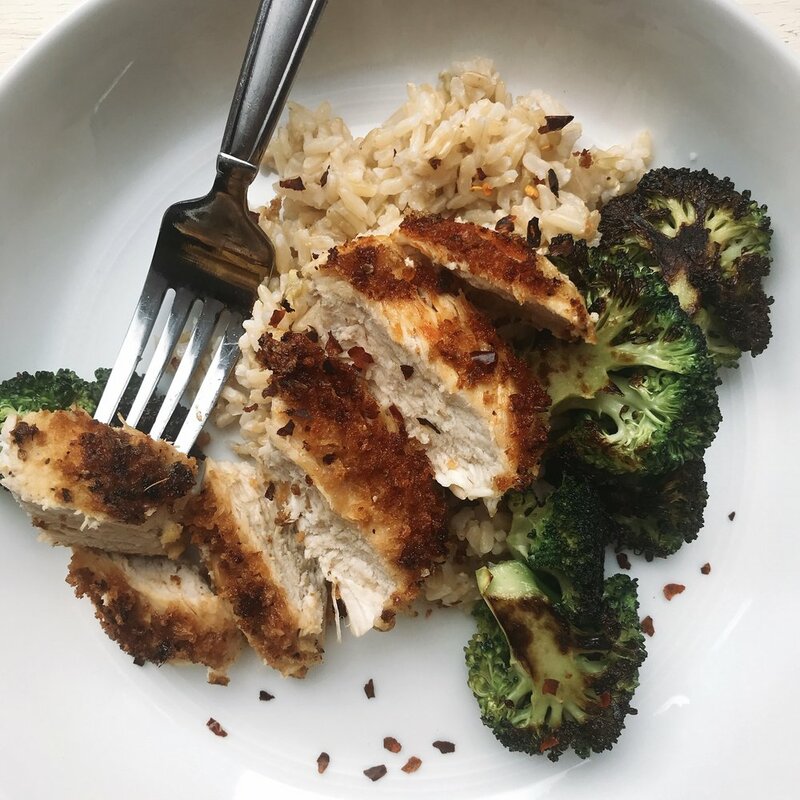 So simple, filling and really hits the spot- especially on a Sunday night, weeknight meal prep, or lunch for work the next day. Feel free to adjust the seasonings to your preference and taste test along the way! Cook time: less than 30 or let it simmer all day on low heat. optional add ins: red bell peppers, carrots, 1/2 sautéed onion. *You can also add in an extra can of black beans or kidney beans etc. In a non stick skillet, cook the ground turkey over medium heat with olive oil until it begins to brown. 10 or so minutes. In a large pot, add all of the above ingredients and the cooked ground turkey. Let it simmer and warm until you are ready to serve/eat! Serve warm, topped with jalapeños, shredded cheese, sour cream, lettuce or with toasted bread and tortilla chips! crispy salmon bites perfect for an appetizer, on top of a salad, in a pita that are full of flavor and can be made in less than 30 minutes! Instead of baking salmon that I had in the oven or on the grille, I wanted to do something a little different. I tend to get stuck in food ruts and eat the same thing over and over again. 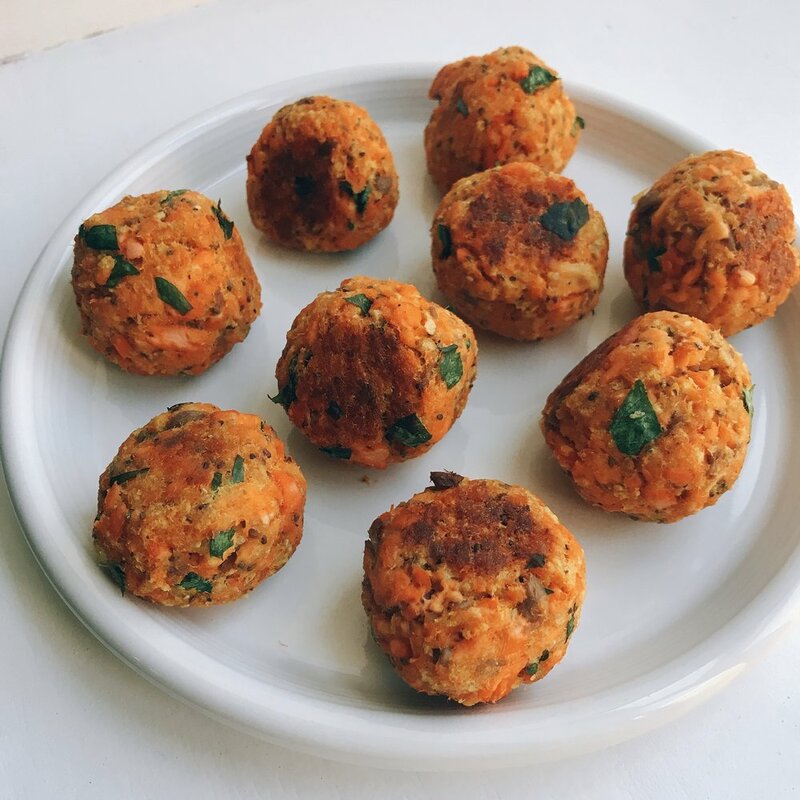 The inspiration for these salmon bites came from the recipe I have on my blog for my Salmon burgers with a cilantro avocado sauce- I love them, but I wanted to make something a little more fun. These bites can be made in less than 30 minutes and they came out so crispy on the outside and tender in the middle! They make the perfect appetizer dipped in your favorite sauce, for a summer party or part of your dinner/lunch for the week! This recipe will leave you with plenty of leftovers so you can snack on them all week long. You do need to cook the salmon before hand, but the recipe is simple to follow. You can also add in any of your favorite seasonings so each time you make them you can change up the flavor. This time around I stuck with sea salt, pepper, parsley, mustard, ginger; keeping it pretty simple. You can always add in onion, garlic, chili powder, really just about anything goes! I also made these with a chia egg because I didn't have any eggs on hand, but an egg will work too! I didn't realize I was out of eggs until halfway through making these, so thank god for chia/flax eggs! Once the salmon is finished baking in the oven and has had time to cool off you simply add all of the ingredients into a large bowl. Then, mix until everything has been fully incorporated, form into bite sized balls and bake! While the salmon was cooking in the oven, I prepared the ingredients that were needed to save some time. I think that dipping the salmon bites in a hot sauce is ideal, or in lettuce leaves with avocado, cucumbers, parsley, chopped onion or in mini pitas! They will last up to 4 days in the fridge, but best when eaten the day of! 1. Preheat your oven to 400 degrees. Line a baking sheet with parchment paper. Season your salmon fillet with sea salt, pepper, olive oil. Bake at 400 degrees for 7-8 minutes on EACH side. Once the fish is done (should flake easily with a fork), allow to cool for 10 minutes. 3. Roll into bite sized balls (size of a golf ball). Place on your baking sheet lined with parchment paper. 4. Bake at 400 degrees for a total of 20 minutes. FLIP after 10 minutes (10 minutes each side). The outside will begin to brown/crisp and the middle with be tender! Serve warm or cold! Store in an airtight container in the fridge for up to 4 days. 1. You can replace the chia egg with an egg. To make the chia or flax egg; in a small bowl add 1 tbsp. chia seeds plus 3 tbsp. water. Mix and allow to sit for 10 minutes. It will thicken. 2. You can sub mayo for greek yogurt or sour cream! I haven't tested it yet, but it should work. 3. Use any breadcrumbs of choice! If you do not have any on idea you can simply add your favorite crackers or nuts to a food processor and blend until you have reached a flour like consistency. 4. They can be served warm, room temperature, or cold! If you want to heat them up, place them in the oven at 300 until warm or under the broiler for a few minutes! A hearty spicy black bean veggie burger that can be ready in less than 30 minutes! A hearty black bean veggie burger that is super satisfying, filling, and spicy. I don't know what it is about burgers, but they are always so satisfying, simple to assemble together PLUS you can pretty much control all the ingredients and the way you cook them. On my blog I've made for you all salmon burgers and juicy turkey burgers, but I know you will love these! These Mexican flavor veggie burgers came out crispy on top and around the edges, but tender in the middle. I personally love any burger cooked in a skillet as it results in more of a tender middle and crispy edges, but you can also place them in the oven (see notes) for about 20 minutes allowing them to firm up, just be careful to not over bake as they can become a bit dry. Black beans serve as the main base for the burgers, and then are filled with corn, sautéed onions, peppers, panko crumbs, cilantro, and loads of spices. They have so much flavor and stay together so well. You can serve them on top of a toasted bun (I used ones from Whole Foods; their Sesame Seed buns) or in a lettuce wrap with avocado, salsa, red onion, or even my cilantro avocado sauce! These spicy veggie burgers are perfect for meal prep or a quick weeknight dinner since all you need is about 30 minutes and just 1 bowl! I love serving them with my sweet & spicy sweet potato fries, my cauliflower tabbouleh salad, or simply just on top of this dairy free kale caesar salad. 1 can (15 oz) can black beans; rinsed and drained. Lettuce wraps or burger buns, tomatoes, avocado, onion or anything to assemble! 1. Over medium high heat, cook the onion, red pepper, jalapeño until tender and fragrant. About 5-7 minutes. Remove from heat while you prepare the rest of the veggie burger. 2. In your food processor, add the beans and pulse until slightly combined- a little chunk is necessary and good! 3. In a large bowl add: the beans, panko bread crumbs, corn, cilantro, and the egg. Mix together completely. 4. Add the cooked onion, red pepper, and the jalapeño to the bowl and mix until well combined. Add in the spices and mix. 5. Form into patties and allow to set in the fridge for about 10 minutes so they can become a bit more firm / easier to cook over skillet. Yields 6 patties or 12 mini sliders. 6. After 10 minutes or so remove from fridge. Heat a cast iron or non stick skillet with 2 tbsp. of olive oil over medium to high heat. Cook the veggie burgers on EACH side for 4 minutes. The edges will be crispy with a brown top/bottom and tender in middle. 7. Remove carefully from the pan and assemble! The first time I made these I served in lettuce wraps with salsa, avocado, onion, and added a little mustard! You can also use toasted buns, as seen here. The veggie burgers will last up to 4-5 days in the fridge or you can freeze them. If you are freezing the burgers, cook first and let them completely cool. Place in a sealed bag in your freezer for up to 2-3 weeks. 1. I did not try a flax egg, but it should work fine. 2. You can make your own bread crumbs by adding your favorite crackers to your food processor and pulsing until flour like consistency. 3. You can sub corn for any vegetable of choice. 4. You can also bake them in the oven at 375 degrees for about 15-20 minutes. These Golden Beet Bites remind me of falafels; in terms of both texture and taste! They are on the savory side, crispy edges, and tender in the middle! I love making them throughout the week and spreading a homemade golden beet pumpkin seed pesto on them for extra flavor! Both recipes are simple to make and really all you need is your food processor, you don't even need a bowl! They are packed with my favorite spices, are nutrient dense and I used pre-diced Honey Vinegar Golden Beets from Love Beets! SO, you do not have to even cook anything before hand! These golden beets are naturally sweet and the only ingredients are: golden beets, honey, white vinegar, and chicory root fiber! They add just a touch of sweetness to the bites and the pesto, but the with everything else mixed in these are definitely on the savory side! Also, they aren't over powering in both of the recipes! It wasn't until this past year that I became obsessed with beets; especially Love Beets Beet Powder which is so easy to incorporate in almost everything: smoothies, salad dressings, spreads, snack bites etc! I also love making crispy beet chips, but one thing that is convenient about the beets, like the Honey Vinegar ones is that they are already cooked and diced! Making it super simple to spread over salads, eggs, and into a recipe like the pesto and the bites. 2. They can help with fatigue! 3. Reduce bad cholesterol, lower blood pressure, and are full of potassium! Love Beets has a page on their website that you can check out here, sharing all the nutritional benefits and some fun facts that beets can provide! These bites make the perfect snack dipped in the pesto, on top of a salad or stuffed inside pita bread! Total time: Less an 1 hour. 1. Preheat your oven to 400 degrees and line a baking sheet with parchment paper. 2. In a food processor add everything but the Honey Vinegar Diced Beets and the cauliflower. *For the bread crumbs, I used almond flour crackers and blended them until they were fine. Use any bread crumbs or panko crumbs you like. 3. Mix everything together until well combined. Add the cauliflower rice and the Honey Vinegar Beets. Pulse a few times until dough like consistency is formed. If the mixture is too wet/moist add 1 tbsp of flour at a time. If dry add 1 tbsp of water or olive oil at a time. 4. Roll into golf ball sized balls. 5. Bake in the oven at 400 degrees for 35 minutes TOTAL. FLIP after 20 minutes, then proceed to bake for another 15. The outside will be crispy and the middle will be softer. 1. To your food processor, first blend the seeds or nuts of choice until almost a flour like consistency. I leave mine slightly blended to give the pesto more of a crunchy texture. 2. Add all of the remaining ingredients except the olive oil. Blend until well combined. 3. With the food processor on, start to add the olive oil. Taste test, adjust to needs, and add more olive oil to reach desired consistency. 1. For both the beet bites and the pesto, adjust the spices to your taste preference. You can substitute any, add more, less, etc! 3. The outside of the beet bites should come out crispy/firm to touch and the middle will be tender. 4. Store in an air tight container in the fridge for up to a week. 1. Any mixture of seeds or nuts will work; just make sure it equals about 2 cups. 2. The nutritional yeast adds a 'cheesy' flavor element, but if you aren't allergic to dairy or want to add in cheese, you can replace the nutritional yeast with something similar to parmesan cheese. 3. The pesto will last in an air tight container in the fridge for up to 2 weeks. 4. Optional add ins: ground flaxseed, hemp seeds, lemon instead of lime, spinach etc.